Happy New Year SWLing Post community! A few months ago, I published a post about Colin Anderton’s excellent Radio Moscow recordings from the late 1970s. Being a space flight enthusiast, all of Colin’s brief off-air recordings feature news from the 1977-1978 Soyuz 26 mission to the Salyut 6 space station. Recently, I started posting Colin’s recordings on a schedule so that each recording is being published exactly 40 years from the original broadcast date. Check out the Shortwave Radio Audio Archive each day (or subscribe via iTunes) to listen to the recordings. Below, I’ve embedded the recording from New Year’s Day 1978 where we learned that Yuri Romanenko and Georgi Grechko toasted the New Year with fruit juice (for obvious reasons, champagne was not allowed on the station!). Click here to listen via the Shortwave Radio Audio Archive. This entry was posted in AM, Mediumwave, News, Nostalgia, Recordings and tagged Colin Anderton, Radio Moscow, Radio Moscow Recordings, Recordings, Shortwave Radio Audio Archive, Space, Space Age on January 1, 2018 by Thomas. We’ve just posted yet another excellent recording by Jim Jordan to the Shortwave Radio Audio Archive. 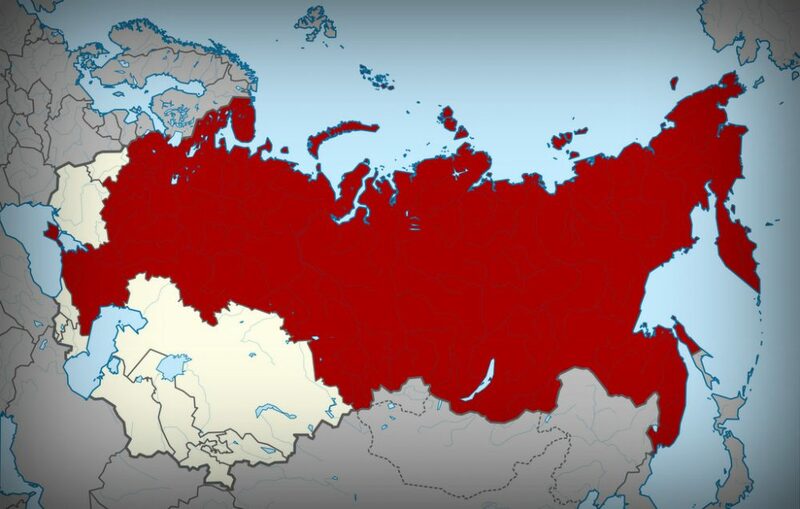 This Cold War recording of Radio Moscow dates back to September 19, 1984. 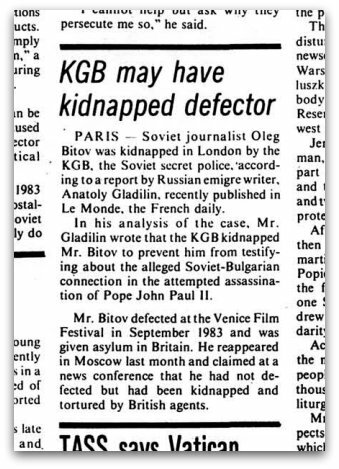 A nice Cold War piece from Radio Moscow on the double defection of the Soviet journalist Oleg Bitov. The real story behind it was revealed ten years later [click here to read article]. Jim’s recording was made using a National Panasonic RF-2200 tuned to 9.5 MHz around 08:10 UTC. The location was South Shields, UK. You can listen to more archived shortwave recordings at the SRAA website, or by subscribing to the audio feed via iTunes. You can also listen to the archive on TuneIn radio. This entry was posted in News, Nostalgia, Recordings, Shortwave Radio and tagged Cold War, Jim Jordan, KGB, Radio Moscow, Spies, The Shortwave Radio Audio Archive on June 23, 2016 by Thomas. 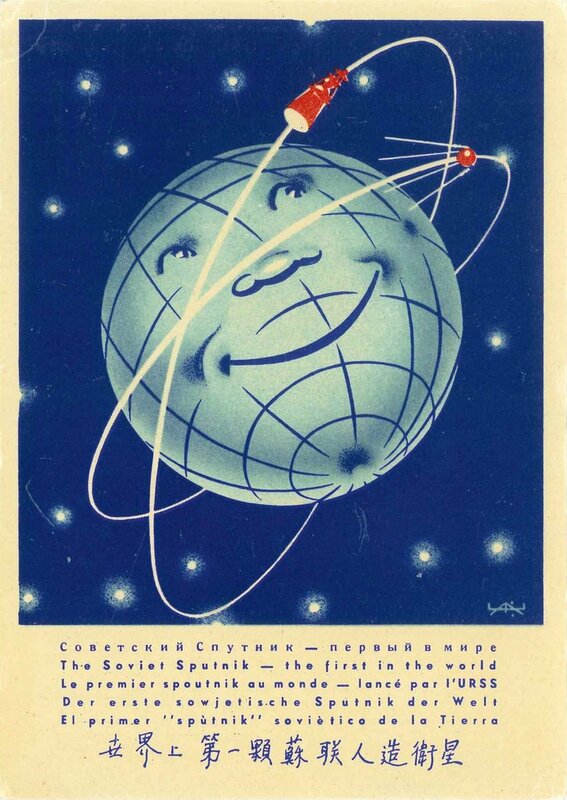 Yesterday, 4 October, was the anniversary of the Soviet Union’s launch of Sputnik I, the first artificial Earth satellite. The launch heralded the beginning of the space age. Sputnik I’s Doppler-shifted radio transmissions on 20.005 and 40.002 MHz led to the development of the U.S. Navy Navigation Satellite System (Transit) and the equivalent Soviet system (Tsikada) and, eventually, to GPS and GLONASS and the other modern global navigation satellite systems. The Sputnik I radio signals were picked up by many shortwave listeners. The 20 MHz signal was close to that of WWV and so was easy to find. And, apparently, WWV turned off its 20 MHz transmitter during some of Sputnik I’s passes over the U.S. so as not to interfere with reception. 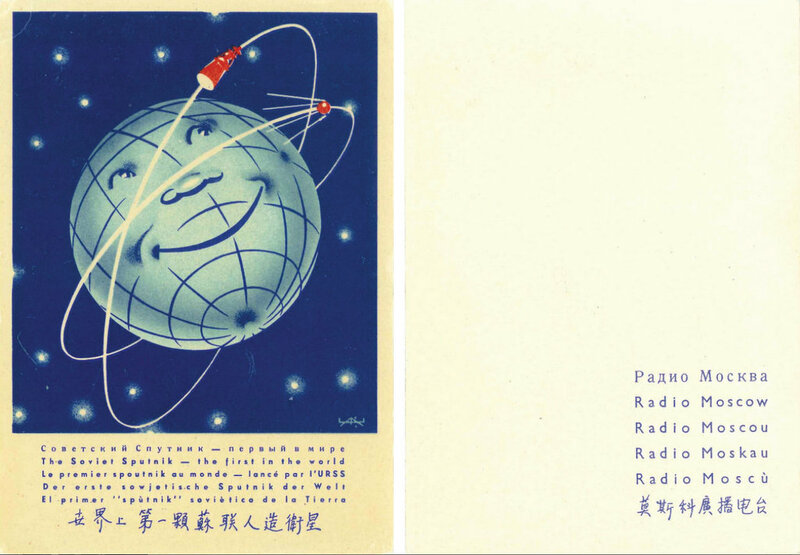 Sometime in high school, I received a card from Radio Moscow celebrating the launch of Sputnik I [see above]. Perhaps it was issued in 1967 for the 10th anniversary of the launch. Richard: You never cease to amaze me! Thank you so much for sharing all of this Sputnik I information and resources! That gorgeous QSL Card is perhaps my favorite design from Radio Moscow. This entry was posted in Boat Anchors, International Broadcasting, News, Nostalgia, QSL Gallery, Radio History and tagged Radio History, Radio Moscow, Richard Langley, Russia, Soviet Union, Sputnik, Sputnik I on October 5, 2015 by Thomas.